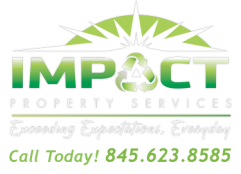 Impact Property Services/ Impact Industrial Services- Formerly Spotless Contracting has been in business since 1995. We started small, and grew to be one of the most respected names in the Rockland County, Bergen County, Orange and Westchester County powerwashing industry. Our Pressure washing division has a combined 30 years experience and take care of all maintenance and repair needs large or small. We firmly believe that word of mouth and referrals are the benchmark of a quality company. 95% of all our customers do not seek estimates elsewhere once they choose Impact. We have completed work at many of the buildings that you may pass in New City, Congers, Nanuet, Valley Cottage, Nyack, Haverstraw, Stony Point, and most other towns. We do adopt a roads in Clarkstown, as a way of giving back to our community. Our trucks are all fully equipped to make sure we are available at a moment’s notice. We are completely committed to keeping our clients 100% satisfied Once you become a client of Impact, you become our priority. Please call or email if you have any questions. If you are looking for a power washer in Rockland, Call Impact Property Services. Gutter Cleaning in Bergen County? Impact Property Services, House Washing in Harriman? 845.623.8585. Hot Water Pressure washing , Roof Cleaners, Siding washing, Building Cleaning, Concrete Cleaning in Westchester? You Guessed it! We are the most experienced powerwashers in the business. We employ people from Tappan, Orangeburg, Pearl River, Bergen County, so we care about the towns we work in. at the Our people make this company.Without great people, you cannot have a great company. When you choose Impact, you get the pride, craftsmanship, and integrity that you deserve. We are truly blessed to have been in business this long. It has been and continues to be a long road, but thanks to our employees, and most importantly our customers, we continue to provide world class service, in a world full of….not so world class service providers. We are here for you day or night……… EXCEEDING EXPECTATIONS, EVERYDAY!